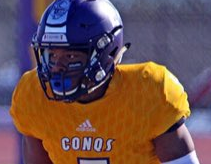 Kennesaw State Football has signed DB Darius Miller of Dodge City CC. He played his high school ball at Coahulla Creek HS in Dalton GA. He is a little older than the average junior – he graduated in 2014, but took a job to help his family. He’s back on the gridiron and should be ready to help immediately in the secondary. He is a cousin of current Owls cornerback Markeith Montgomery.